Unfold puff pastry and place 1 sheet on each of 2 baking sheets. Bake until the dough has puffed, but is still soft, and not yet browned, 7 to 10 minutes. Set a wire rack directly on top of the dough, and press gently to flatten to about 1/8-inch thick. Continue to bake until lightly browned, 8 to 10 minutes. Let cool on a wire rack. Transfer cooled pastry to a cutting board. Increase the oven temperature to 475 degrees F. Using a serrated knife, cut the pastry into 18 (2–by-3-inch) rectangles. (If you have extra pastry, cut out a few more rectangles to replace any that break.) Evenly dust the pastry with 1/2 cup of confectioners’ sugar. Return to the baking sheet and bake, until the sugar is melted to a glaze and the pastry is browned, 2 to 3 minutes. Transfer to a rack, and let cool. (This can also be done under a broiler if watched very closely). In a medium bowl, combine the heavy cream and creme fraiche. Add vanilla seeds and remaining 2 tablespoons confectioners’ sugar; whisk until stiff. Transfer the whipped cream to a disposable pastry bag. Cut about 1/2-inch from the tip of the bag with scissors. Pipe a 1/4-inch-thick layer of whipped cream over 12 of the pastry rectangles. Cover with a single layer of berries. Top 6 of the berry-topped pastries with one of the remaining 6 berry-topped pastries. Cover each with reserved plain pastries. Transfer each napoleon to a dessert plate, and drizzle each plate with about 2 tablespoons raspberry coulis. Place the raspberries in a medium bowl. Using a fork, mash the raspberries to release some of the juices. Stir in the sugar, using just enough to take the edge off the tartness. Let them macerate for 20 to 30 minutes. Transfer to a blender or food processor, and puree until smooth. Strain through a fine mesh sieve to remove the seeds. It may be necessary to add a little water to thin the coulis. 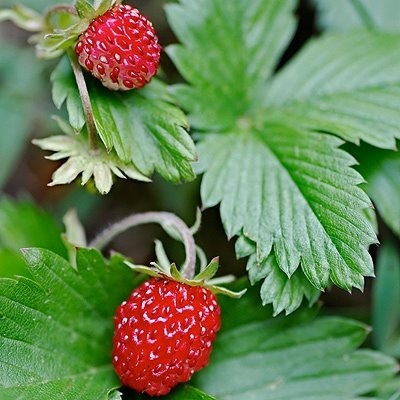 The strawberries you get from this plant are much smaller than the cultivated varieties, but they’re much more flavourful and make an excellent trail-nibble. You can also eat the leaves raw or in cooked dishes. Alpine strawberries make a better ground cover than cultivated varieties, and we use it extensively in our edible landscapes as an understory plant. They don’t spread by runners, and instead put their energy into producing fruit, which they do from june through september.